Do you podcast? I mean listen to them? I've been told that I should. I've tried, I just can't listen for a length of time. For me listening is something that's background ... like music, or it's something I have to devote my attention to. I just never get that much attentive time. I was told while jogging is a good time, but I just need something to pump me up and remind me that I have to block out my will to stop running. Point is, podcasts aren't for me... but I know LOTS of people who are obsessed with their shows. It's the new 'TV' I guess. So how do you listen to your podcasts? Well, one app is updating itself for some enhanced experiences... check out the press release below. So, it looks like there's going to be some new abilities for searching, by episode or discovery and a streamlined experience. Maybe you'll enjoy them. 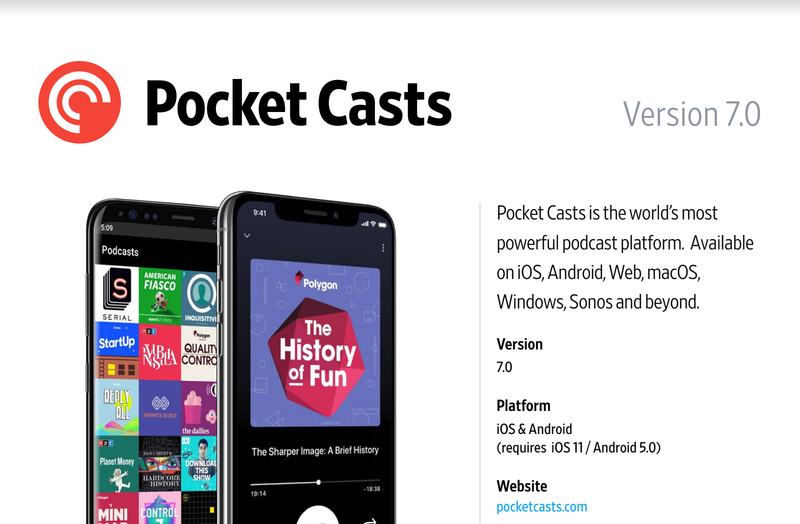 NEW YORK and ADELAIDE, AUSTRALIA -- Nov. 14, 2018 -- Pocket Casts, the world’s most powerful podcast platform, today announced a major redesign that greatly improves the listening experience and reinforces the company’s commitment to serving the medium’s most passionate fans. The updates enable users to access their favorite podcasts seamlessly, with new tools at their disposal for discovery, curation, and playback, as well as an integration with Siri Shortcuts for iOS devices. Today’s announcement comes just months after Pocket Casts’ acquisition by the leading podcast publishers: NPR, WNYC Studios, WBEZ / This American Life, who are collectively responsible for more than 210 million podcast downloads per month. Created in 2010, Pocket Casts is one of the most celebrated and highly-rated platforms for podcast listening. The platform’s listeners engage more than industry averages, tuning in nearly 7 hours per week with 50 percent of users returning daily. In all, the paid app features more than 500,000 podcasts for listeners to select from. Critically acclaimed, Pocket Casts has been recognized as "the podcast app every iPhone user needs" (WIRED) as well as "the best podcast app for Android" (The Verge).